I-Evo, a UK manufacturer of new generation fingerprint readers, endeavouring to ensure entry is allowed to authorised personnel only into restricted areas of Airports globally. Our reader is ideal for Airport Access control as fingerprints are the one form of security that can’t be copied/lost or stolen. Security is paramount, but the system needs to be reliable and allow those who have access rights entry and deny those who don’t. The world’s leading matching algorithm allows exactly this without jeopardizing or requiring adjustment of tolerance levels. With the ‘brains’ of the unit being a small control board and stored internal of the access point, this prevents access by removal of hardware and shorting of connections – experienced on other products on the market. Unless a new build, an airport will already have a form of Access Control – whether its keypads/Cards or Fobs – therefore the infrastructure is in place. To replace fully and install a new system would be an immense drain on capital expenditure, but I-Evo allows simple integration into current systems – meaning you only replace the hardware at the access point, and no duplication of databases for access rights. Whether or not the controlled access point is internal or external is irrelevant to the I-Evo reader as the capabilities (as proven in the recent product video available on the media page on our website) enables the reader to operate in extreme conditions. The minimalistic design, great aesthetics, retro fitment and custom color option allows the security element of any airport to be courteous to the increasing importance of the design of any interior. We have leveraged over a decade of biometric experience, including all aspects of biometrics from specification and installation all the way through to the end user experience. From this experience, we identified the downfalls of the physical design and restrictions incurred by the design, consequentially producing a fingerprint reader that is minimalistic in design, with great ergonomics but still adhering to DDA requirements. The design has resulted in our fingerprint reader being easy and simple to use, consequentially not hindering footfall or workflow through the access points. The I-Evo reader has no screen or pin pad which is the easiest part of any reader to vandalise. The ABS polycarb mix for the casing, offers both flexibility and rigidity, therefore along with the toughened glass sensor, peizo button and security mountings, the I-Evo reader is as vandal resistant as possible. One last design factor that was considered was the colour. From research with end users certain colours maybe required for corporate branding or specific for market sectors., therefore we have a option available for the I-Evo reader to be manufactured in any custom colour on receipt of a RAL number. The I-Evo reader is IP65 rated, finally offering a reader that can be mounted externally or internally without compromising the efficiency or reliability. We have considered the fact that the system needs to be courteous to its surroundings whilst managing the airport access control, therefore the I-Evo reader can be Flush or surface mounted offering the desired aesthetic requirements for the environment. 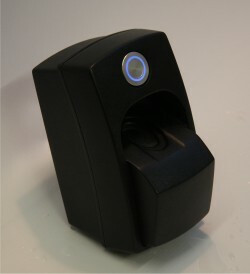 Using the MSI sensor, the I-Evo reader will obtain a fingerprint image through water, dust, oils, creams and even some latex gloves – as proven in our product video – http://www.ievoreader.com/media.php. Coupled with the IP65 casing, the I-Evo reader can be used in the harshest of environments. 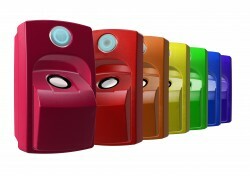 Unlike most other biometric readers, I-Evo does not have to be mounted in a case or a box to work externally. The external I-Evo reader has a built in heater system to allow normal operation to -20°C. 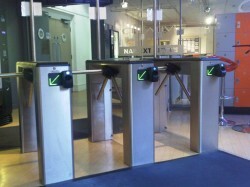 I-Evo has been designed to integrate seamlessly into existing access control systems currently using card, fobs or pins. By utilising the wiegand input and outputs, I-Evo works with 3rd party manufactures controllers, allowing airports to easily and cost effectively upgrade certain access points or all access points, with a reliable and superior fingerprint reader resulting full airport access control. Most other biometric access control products have the controllers, relays and data built into the reader, therefore external to the access point. Majority of these readers can be easily removed allowing access to be gained on shorting the relay. The I-Evo fingerprint reader contains none of these, and the matching board is housed internally of the access point, up to 5 meters away, next to the currently installed ACU, allowing secure access for up to 8000 authorised personnel. IF the I-Evo reader is removed, it is deemed useless, as there is no data stored on the reader itself and the access point remains secure. Please join us on Facebook and Youtube to find exclusive videos and news.